Selecting strategic suppliers has always played a significant role in long-term organizational plans. What is noteworthy in this process is the data on the basis of which the organization implements its supplier selection model, that is; uncertainty in the value of these data and the effect of uncontrollable factors on decision-making criteria can play a significant role in selecting a strategic supplier. 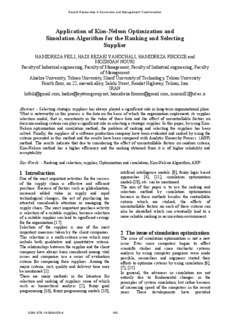 In this paper, by using Kim- Nelson optimization and simulation method, the problem of ranking and selecting the suppliers has been solved. Finally, the suppliers of a software production company have been evaluated and ranked by using the criteria presented in this method and the results have been compared with Analytic Hierarchy Process (AHP) method. The results indicate that due to considering the effect of uncontrollable factors on random criteria, Kim-Nelson method has a higher efficiency and the ranking obtained from it is of higher reliability and acceptability.